NOTE: This book has not yet been released. I was given a free Advance Reading Copy by HarperCollins and Edelweiss in exchange for an honest review. This book will be released on August 7, 2018. If you would like to send me an ARC, please see this page. PLOT SUMMARY: Grant was stunned when his friend Rose quit the newspaper out of nowhere two months ago. For four years, the two of them had worked faithfully on the paper, planning to go to Northwestern and become the star reporters they were always meant to be. But now, Rose seems to want nothing to do with the paper -- or Grant. That is, until prom night, when a sudden, real, dead serious, this-is-not-a-drill lockdown causes everyone to think one thing: gunman. Grant is stuck inside the gym, while Rose is caught outside and finds herself hiding in a classroom. Grant is determined to find out who the gunman is and what can be done to stop him -- but Rose quickly finds out that something much, much stranger is going on, and the night becomes a mad dash to get the real story before anyone can get hurt. FIRST THOUGHTS: I read this all in one sitting, and I doubt I'll be the only one once this book hits the shelves. It's extremely easy to get through, with a fast-moving plot and a compelling voice. I was mostly satisfied by the ending, but honestly, my main thought after the book ended was, "Well, that was fun." This isn't normally the sort of YA I like, so it's probably not surprising that this didn't grab me the way other books do. That said, I liked it well enough, and I'd recommend it to others. There's plenty to like about this book, as I'll detail below. THOUGHTS ON PLOT: Okay, so apparently, this novel was inspired by His Girl Friday, a classic movie. I've never seen it, and I never would've guessed this was a retelling of another story. It stands on its own, and that's good. The book is told in anachronic order, jumping around from the night of the prom to scenes that took place months or even years before. While the prom night plot was very well-written and kept me engaged, some of the flashback scenes felt a bit pointless. Definitely not all of them -- a lot of them deepened character or foreshadowed later events. But a few of them, I didn't see why the author chose to include them, and that made it drag a little bit. The mystery aspect of this book was a bit of a mixed bag; I was wondering who the culprit was, but I can't say I was truly invested. As I'll elaborate on in the next section, I think the book has some really great side characters, and I wish the story had focused on them a bit more; I think it would've been a better book for it. THOUGHTS ON CHARACTERS: This book is a good example of how one bad lead character can drag it down for everyone else. I liked Rose a lot, though I didn't always understand her motivations. Maybe it's because I can't personally relate to many of her struggles -- a reader who has had an identity crisis like hers might feel differently. But her personality and wit were more than enough to win me over. It was Grant I hated. I know that him starting the story as a self-centered, insufferable tool is kind of the point, and I'm glad he undergoes some serious character development, but seriously, Rose, you can do better than him. So can Nick, Grant's best friend -- a side character I really liked. Actually, I really liked most of the side characters, especially Jenna, Rose's best friend. Had the book been about Jenna and Rose, I probably would've liked the book more -- I wish I'd seen more of their dynamic, especially when Grant and other drama wasn't getting in between them. THOUGHTS ON WRITING STYLE: As mentioned above, I got through this entire book in a single sitting, which is a testament to how easy it was to get drawn into the story. The book shifts between Grant's and Rose's perspectives, and while for the most part it works well, I will say that it felt a bit... jarring when it happened mid-page. (I'd say mid-chapter, but this book was more broken up into "sections" than "chapters." Read it and you'll see what I mean.) The third-person narrator wasn't quiiiite omniscient, but we didn't feel 100% in either of our leads' heads. Sort of like we were in both their heads at once. I think this might be one of those things that gets cleaned up just before publication, and it's not a huge issue -- just something to consider. THOUGHTS ON POLITICAL STUFF: This book is far more political than I thought it would be, but honestly, that was the best part. Along with the commentary on casual sexism and normalized assault, especially when the perpetrators are cute, white jocks, there's also some great commentary on gun control. Maybe that shouldn't be so surprising, given the plot, but I was impressed by how the author just went for it instead of dancing around the issue. Major props! The Last Best Story also has some of the best casual representation I've ever seen in YA contemporary. The multitude of POC, queer characters, and disabled characters isn't a big deal, nor should it be. They're not there as tokens or because their diversity is relevant to the plot; they're there because in the average American high school... you will see a multitude of POC, queer people, and disabled people. No matter what certain people say whenever they start crying about authors "forcing diversity." Seriously, folks -- real life is diverse, and if your preferred fiction is all straight, able-bodied, and white, that's your problem. Representation and diversity in fiction matters, because the real world is diverse. Die mad about it. 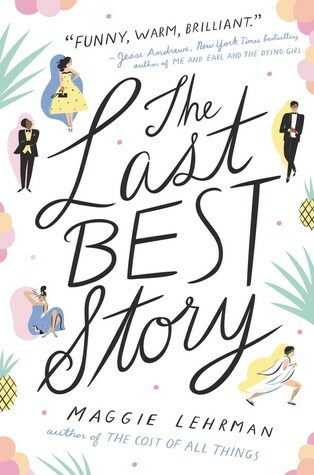 FINAL THOUGHTS: This is an enjoyable, fun contemporary novel. It's not what I'd call a "favorite," but it's certainly very good -- if you're a fan of His Girl Friday, or contemporary in general, I'd definitely suggest checking it out. The unexpectedly good political commentary is something I hope other books of its kind will choose to emulate in the future, and I'd be very curious about anything else Lehrman publishes in the future. 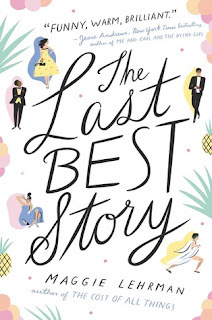 If you've read The Last Best Story, I'd love to hear your thoughts in the comments below! If you haven't, I'd love to hear if you plan to read it when it comes out. I am currently running a giveaway! I'm giving away a free copy of The Cruel Prince by Holly Black. It closes January 29, 2018, so enter now!